In the basement of a nondescript campus building in the suburbs of Boston lies a river. A miniature highway hugs its eastern shore, while tiny houses and barns litter the western bank. Towering over this scale model is the gleaming vitrine of a weather simulator. This is the lab for the flood study. As an intern for the project, Jack has been transcribing interviews with people who live on the actual river, listening to them answer questions about environmental change on the local level and their emotional responses. Lately, he has questions he wishes he could ask Cynthia. The two of them were close in high school, years ago, and she seemed genuinely happy to pick up where they left off, yet now she’s growing distant. Her parents have noticed it, too, and when they’re forced to confront the severity of her depression, they call on the only professional they know: Henry, once a student in her father’s middle school shop class, now a psychology professor. Henry wants to help his old teacher’s family, but his own household is in jeopardy. There’s a stubborn wedge between him and his wife, pregnant with their first child, and she is clinging to secrets of her own. 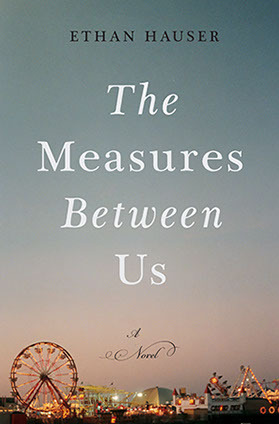 By turns sweeping and intimate, The Measures Between Us takes as its subject the shifting covenants we make with ourselves and with the ones we love. What binds these characters is what binds us all: the flawed relationships, roadside encounters, calls answered, and letters unopened that make up a community, and a life. It’s a humbling American story about the distances we keep and those we’re bent on erasing, a finely rendered portrait of heartache and grace.